Participants are trained to “observe and report” criminal activity and suspicious activity to the San Diego Mid-City Police Division. The Talmadge Patrol was started a group of neighbors in Fall 2007 who were concerned about an increasing crime rate in Talmadge. To address the problem neighbors began working together to develop several programs associated with our Talmadge-based neighborhood watch program, including the Talmadge Patrol and the Graffiti Elimination program, “E-TAG” (Eliminate Talmadge Area Graffiti). Patrolling works to reduce crime! Statistics from 2008 through 2011 show a 50+% reduction in crimes in the Talmadge neighborhood. The mission of Talmadge Watch: Volunteer Citizens Patrol is to enhance and support the delivery of public services to the community of Talmadge and adjoining neighborhoods. Participation in the Talmadge Patrol is completely voluntary. The Patrol currently has more than 30 registered volunteers. The Talmadge Patrol provides training in conjunction with the command of the San Diego Police Department’s Mid-City Division. The ultimate benefit from the Talmadge Patrol program is reduction of crime in the Talmadge neighborhood. Working cooperatively, neighbors are helping to ensure that Talmadge is a more secure, safer, cleaner, and more friendly environment in which to live and thrive. All services are provided free of charge and all donations to the TW:VCP 501(c)3 are tax deductible. Financial contributions are greatly appreciated and help offset the costs of equipment, operating the Talmadge Patrol car, and supply costs for the E-TAG program. Interested in volunteer opportunities or making a donation? Email talmadgepatrol@yahoo.com, or you may reach the volunteer phone line at 619-453-8268. Financial contributions are greatly appreciated and help offset the costs of equipment, operating the Talmadge Patrol car, and supply costs for the E-TAG program. 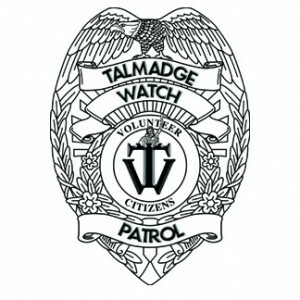 Officially, the Talmadge Watch: Volunteer Citizens Patrol (TW:VCP) is a 501(c)(3) tax exempt charitable organization. For tax reporting purposes, you will receive a TW:VCP fulfillment letter stating the FEIN# and that your contribution may be claimed as a charitable donation on your federal tax return. To mail a donation, please follow these instructions to write/mail your check and ensure your donation is applied properly. We thank you for your generosity and support! NOTE: By donating you permit us to post your name as one of our Patrons if we establish an “Our Patrons” thank you section on our webpage. If instead, you prefer to be posted as ”Anonymous”, or posted to include the members of your household/family, then please enclose a note of your request with your check. If you have any questions, please email talmadgepatrol@yahoo.com – thank you! In addition to the Talmadge patrol program, TW:VCP organizes a variety of volunteer services and activities designed to promote public safety and security. See our current projects below.